Click Here Green Grass!!! We Bring the Power and Water to You!!!!!! 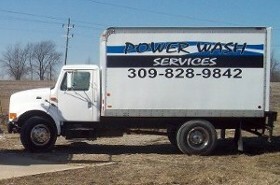 Power Wash Services' work is guaranteed. Central Illinois' cleaning and protective coatings specialists since 1994. We protect and beautify your property. We use environmentally friendly biodegradable cleaners. Trucks equipped with mobile water supply with variable pressures from 30 psi to 5,000 psi and temperature controlled up to 220 degrees. Friendly services and competitive prices. No job too small, too big, or too difficult. Let us know if you have any questions regarding our products, services or equipment for your needs. We offer a wide variety of services so call us if you can't find what you are looking for and we would be happy to help! !